So, the handsome, clever godson turned 21 last weekend. A shocking head cold prevented me from joining the other old aunts in the old aunts’ corner of the party, so all I could do was snuffle good wishes down the phone. What’s the coolest gift you’ve got so far? I asked the birthday boy. “I guess that would be the watch mum and dad gave me,” he replied. Only the kind of expensive carbon-fibre chronograph you might just end up giving your right arm for in the wrong neighbourhood in the United States from whence he’d just returned as a uni exchange student. “I’m not really a watch kind of guy myself, but it’s pretty nice,” he said. I don’t know what, if anything, lives up to the expectations of turning 21 these days. Really, it’s been redundant as a coming of age since Gough Whitlam lowered the age for voting not long after ending conscription for 18-year-olds who were then still being sent to Vietnam to die. And now that, thanks to the Abbott Government you’re unlikely to be able to afford to leave the parental home until age 35, the over-sized wooden key would just seem to add insult to injury. Setting down the phone, I disappeared down a Codral-lined rabbit hole to the primordial past of my own 21st. Back then I was captive in an all-female version of Lord of the Flies. We were sleeping on mattresses on the floor in a flat above a butcher’s shop in western Sydney, living on a diet of alcohol, cigarettes, sausage and apple curry, No Doze and Nescafe. And my parents gave me … a coffee table. Not just any coffee table. A monstrous great cube of varnished pine with two shelves of grey smoked glass thick enough to protect a passing Pope. What were mum and dad thinking – that it would be somehow civilising? The coffee table survived several slovenly uni student households and was the only item of furniture salvaged from among the milk crates when I finally escaped on the pay packet of a suburban newspaper cadet journo. From the wilds of Westmead it accompanied me into the inner city when I got my first metro newspaper job. It proudly supported finger food at my engagement. And, when we returned from South America married, it was joined by a fold-up-stuff-your-own-genuine-Argentinian-gaucho-leather-couch purchased in Buenos Aires with the very last of the travellers’ cheques. It bore silent witness at a subsequent party when a former child actor called Nick Yardley – who starred as Snow in the 1947 film A Bush Christmas and worked briefly in a tannery before becoming a journalist – tore a strip off said couch, set fire to it proving – just as he’d insisted – it was indeed made of cardboard. And when, almost seven years later and not long after the godson was born I split from his uncle there was no dispute when we divided the marital spoils. Really, wouldn’t you like the coffee table? “Nope, that’s most definitely all yours,” he’d insisted. Thus is became part of a new life and a new love. Since then it’s moved cities and states, been there in sickness and in health, for richer and poorer, as unlovely and inscrutable as ever. And year on year, stolidly reminds me the greatest gift of being 21 is time. Truly, there’s no shame in admitting that until just this second you had no idea that May was “International Respect for Chickens Month”. Who doesn’t love chickens and respect them an awful lot, but I’ll be plucked if they don’t have a lot of competition. May is also the month for awareness of Neurofibromatosis, Domestic and Family Violence, Chrohns & Colitis, Premature and Sick Babies, and Mindfulness. And, reading this, you may be somewhat disconcerted to discover you’ve also missed whole weeks dedicated to Australian Dance, Motherless Daughters, Mothering, Multiple Chemical Sensitivity, Food Allergy Awareness, Motor Neurone Disease, Family Day Care, Hearts, Tourette Syndrome, Law, Volunteers, Families, State Education, and Schizophrenia. Fortunately – even though little more than a week of May remains – there’s still more than two concurrent months’ worth of of events ahead, including Spinal Health Week (now), National Palliative Care Week, Macular Degeneration Week, Week of Solidarity for People of Non-Self Governing Territories, Kidney Health Awareness Week, Exercise Physiology Awareness Week, Global Action Week, International Building Safety Week, and last, but most certainly not least, International Pickles Week. You may not find it terribly funny that you’ve missed World Laughter Day, can wash your hands completely of World Hand Hygiene Day and not even Luke Skywalker can save International Star Wars Day. The United Nations-decreed global two-day “Time of Remembrance and Reconciliation for Those Who Lost Their Lives during the Second World War” (May 8-9) could have been a tad overshadowed by the earlier Anzac Day. Other possibly overlooked calendar highlights include World Belly Dance Day, International Museum Day, Telecommunications Day, Fair Trade Day, International Nurses Day, World Migratory Bird Day (definitely not for chickens), World Lupus Day, the International Day of Families, World Asthma Day, Ovarian Cancer Day, Free Comic Book Day, No Pants Day, International Firefighters Day, Lost Sock Memorial Day, Eat What You Want Day , International Day Against Homophobia and Transphobia, and Dance Like a Chicken (there they are again) Day. And, you can’t even drown your sorrows about this, because World Whisky Day is history too. If you need an excuse to wear ugly leisure wear you’re OK because, as befitting a symbol of total slackness, Tracky Dack Day can be observed at any time during the month. Publication of this column also comes in the nick of time to celebrate End of the World or Rapture Party Day as first erroneously predicted by US evangelist Harold Egbert Camping to fall on May 21, 2011. And, we can still do our bit on National Myeloma Day (May 21), generally for International Biodiversity Day (May 22) and quite specifically on International Turtle Day (May 23). The message here is that – among the clearly flippant – most of these observances are born of attempts to raise awareness of serious and important topics including, most significantly, National Sorry Day (May 26). Then there’s World Multiple Sclerosis Day (May 28) International Day of United Nations Peace Keepers (May 29), White Wreath Day to support family and friends of suicide victims, and 65 Roses Day for Cystic Fibrosis (both May 30) and World No Tobacco Day (May 31). But, if amid all that, you forget International Hug Your Cat Day, there’s no need to have kittens. The boss has a mantra. “Tell me something I don’t know,” she’s famous for saying. That’s not always so easy, as obviously she’s omniscient, but also dead right: you should try to learn something every day. Only trouble, today is the grandniece’s second birthday party and we’re all wearing Minnie Mouse ears and, surely, this can’t be conducive to enlightenment. But, watching the birthday girl and young family friends of various ages, I’m blown away by discoveries. First of all, it becomes clear that five-year-old Casey* is a kleptomaniac. Between my own gleeful consumption of handfuls of jaffas, red jelly, raspberry and blackberry lollies, I watched as she removed the special mouse blindfold, spotty ribbons, and several carefully wrapped prizes from the main party table and secreted them in her mother’s handbag. This will cause major consternation when it comes time for Pin the Bow on Minnie. But first there is a craft exercise: Decorate Your Own Minnie Head. The grandniece is obviously a gal after my own heart and likes shiny things, eschewing stick-on eyes altogether, so unbroken strips of ruby and diamond sequins soon cover the entire mouse mask and much of her Aunt Mel. There’s a gentle girl with glasses who generously helps the younger children while trying to protect her own artful creation, featuring dyed feathers, ladybirds and butterflies, from miniature marauders. But no one seems to have any inclination or inspiration to use the fluorescent pipe cleaners. I remember making creatures out of egg cartons with pipe cleaner legs … 45 years ago. And – even then – you’d be lucky to find too many people who smoked pipes. My husband, who many, many moons ago used to affect a Sherlock Holmes-style pipe as an alternative to unfiltered Rothmans at the kind of late ’70s, early ’80s dinner parties that concluded with Bombe Alaska, was gobsmacked. What do we call them now? he wondered. What, I mumbled back through the strawberry mousse and black plastic mouse ears the grandniece’s little friend was simultaneously endeavouring to shove into my face. Pipe cleaners, what are they called now? Well, as it transpires pipe cleaners are still as much a part of the children’s creative play kit as ever, but are now called chenille or craft stems. 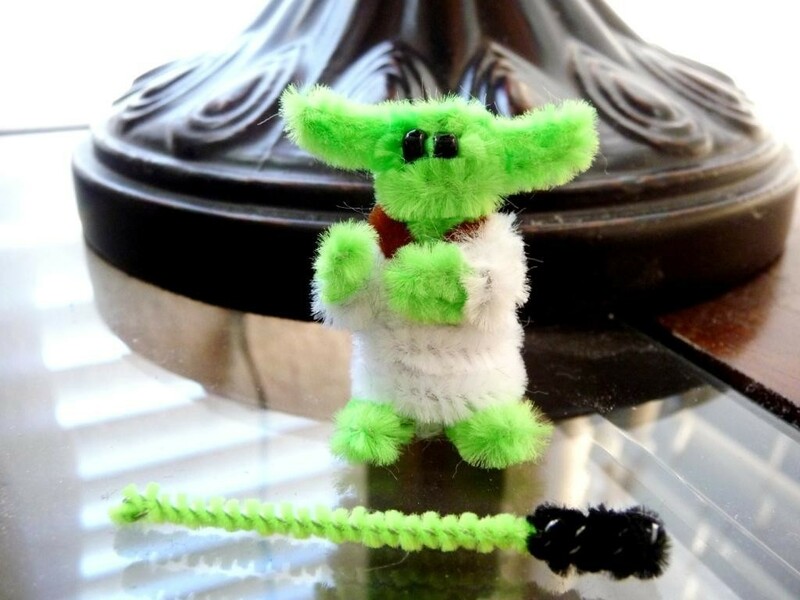 In fact, they’ve been elevated to adult art and transformed by a thriving community of tremendously talented chenille stem sculptors into everything from Yoda to convincingly life-like animals including wolves, foxes and Thylacines. But now it’s time for the Minnie piñata. Casey brazens it out, until her mother decides to fetch a cardi from the car and, while retrieving the keys from her bag, discovers a cache of mouse-related contraband. Chastised publicly, Casey turns to me, the nearest person, just as I’m stuffing several Minnie Mouse party-shortbread-favours into my mouth …. and rats me out. “She took something too,” she says pointing an accusing finger at a dozen or so colourful pipe cleaners that seem to have spontaneously sprouted from my camera bag. My husband is staring intently at the sky, whistling the Mouseketeers Club march. Yep, something new every day.